Atopic skin can be irritated, itchy, painful, and put you in a low mood. Atopica oil was initially developed for a young girl, who was experiencing the above symptoms on her body overall. The child’s skin responded quickly to treatment which brought relief in general, calmed down the irritation, conditioned and strengthened her skin and brought back gladness and joy. Both the scent of the product and the good sensation on her skin contributed to her happiness. Atopica oil contains many vegetable oils and essential oils, each of which serve a very specific purpose in enhancing the skin’s wellbeing. It doesn’t contain any synthetic or harmful, irritating materials. All the oils have been cold pressed or disteilled from organically grown plants. The positive effect of seabuckthorn oil is a true elixir and carries many beneficial properties for wellbeing. 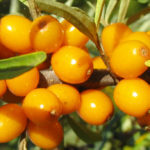 For example, seabuckthorn oil boosts the immune system and the health of your skin. Seabuckthorn berries contain great amounts of vitamin C, A, E, K and B, as well as flavonoids, healthy fatty acids that activate the renewal of the skin andstrengthen it’s structure. As for the essential oils, chamomile calms down skin irritations, pine soothes the itchiness, lavender boost skin renewal, thyme is a gentle antiseptic and wards off infections. Frankincense, lavender, and chamomile also calm down the mind and eases the feeling of stress. Children under 3yrs, 1ml of Atopica oil + 9ml of jojoba oil, preferably organic. Children 4-7yrs, 3ml Atopica oil + 7ml jojoba oil. Children 8-12yrs 5ml Atopica oil + 5 ml jojoba oil and adults can use it without dilution. PLEASE NOTE: If you’re allergic to chamomile your skin may have a reaction.